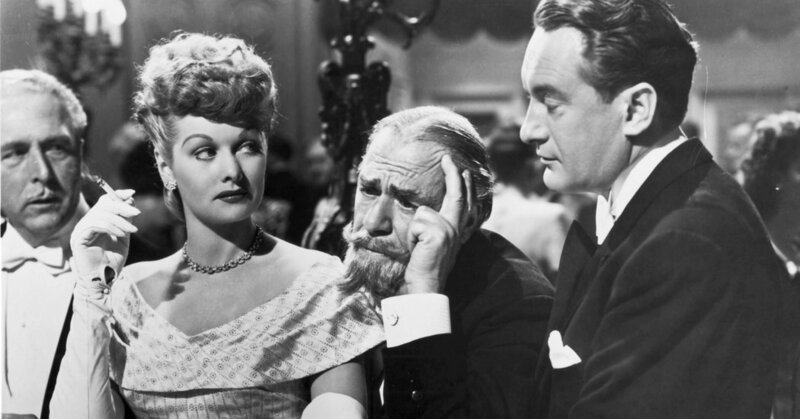 I'm not surprised studios really didn't know what to do with Lucille Ball in the 1940's as she's drop-dead gorgeous but very, very much already the Lucy you think of with the withering reactions, curl of the lip, middle-distance stare when something is weird. Maybe she could have worked as a throw-back to 1930's screwball comedies, and maybe that's how folks saw her when she took to the small-screen - I'm unsure how she was perceived as I'm not quite that old. 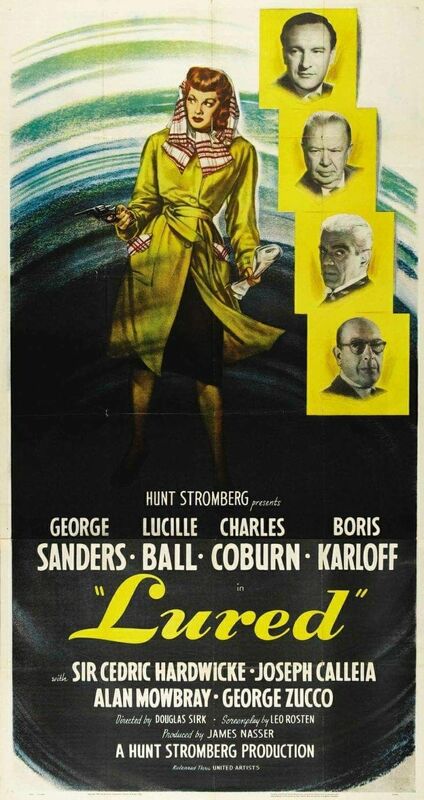 In Lured (1947), she's not a femme fatale, nor the domestic goddess the hero needs to return to. Ball plays a New York showgirl stranded in London after the show she came to open in closes after a week, leaving her broke and with no boat fare or prospects at home, anyway. So, she's taken to taxi-dancing to make ends meet, sort of Lucy-ing her way through the nightlife scene with would-be Romeos trying to charm or coax her into making some additional coin (the Hayes Code used taxi-dancing as an entree to talk about prostitution without saying "hookers"). Her friend and fellow-taxi dancer is killed by what we'd now consider a "serial killer" - one who sends letters to the cops ahead of the murder with specifics that don't make any sense as anonymous letters about anonymous women, but also imitating the poetry of Charles Baudelaire. When Lucy goes to the cops to share what she knows about her missing friend, they recruit her as a target for the killer. Along the way she meets and falls in love with George Sanders playing a nightclub owner who may or may not be the killer. who among us hasn't had a bearded old man interrupting our game when hitting on a lady? She can play soft, and she does so here in romantic moments as you get the feeling her character is navigating new waters falling for Sanders (I know!). 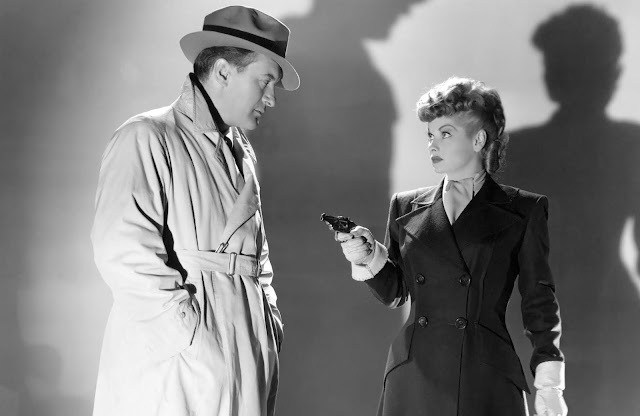 But she's also still Lucille Ball - a tough dame with opinions, who knows how to work a moment that isn't necessarily on the page. 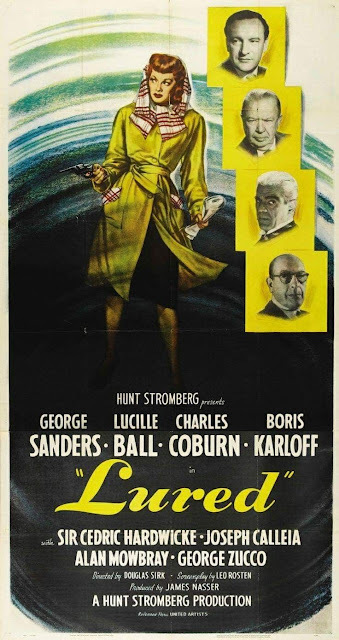 The film includes a great short scene in the middle as Lucy pursues suspects, stumbling across Boris Karloff in a scene that's just a whole bunch of fun and inserts some classic horror thrills into the noir. Directed by Douglas Sirk, the film shows - aesthetically - some of the sumptuous design I associate with stuff like Imitation of Life, and some curious framing of shots. But the movie is more than merely competently directed, it has a great rhythm, swings well between tension and humor, and understands character better than many of the genre. In many ways, it feels far more modern than other films of the genre and era. This would be a great date movie, and I sorta regret watching it by myself. With a strong female lead, a mystery that only sorta overplays its hand, and a strong romantic plot - good one for a bottle of wine and a movie. I'll watch it with you sometime. I was intrigued listening to Eddie's preview.